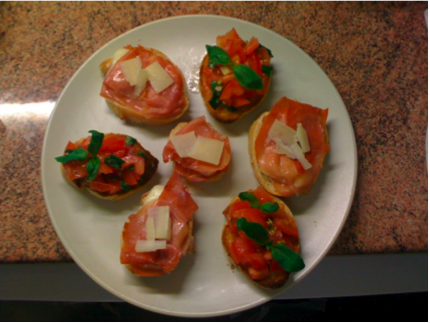 Recipe 96: Let’s speak about the most classic Italian starter and let’s do it once for all: here is the recipe of the real Bruschetta and to make the dish a bit more interesting i have also added some Crostini. 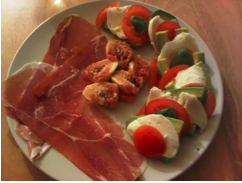 Ingredients for 2 people: 4 tomatoes, basil, olive oil, salt, pepper, garlic, Parma ham, mozzarella, Casareccio Bread (impossible to find in England so i just used a classic baguette), Parmesan. The bruschetta is very easy, reason why i can’t stand when they serve something totally different in some place here in London. You just need to cut some nice red tomatoes in little pieces, add some garlic in pieces ans some basil leaves. Mix everything with some good olive oil, salt, a bit of pepper if you want and leave it there for some time. More you will leave it and more sauce you will get from the tomatoes and all the ingredients will release their amazing taste. Another very important element is the bread: this in theory need to be “Casareccio”, a very common type of bread in Italy. It’s characteristic, on top of the particular taste, to be quite hard outside, but very soft and reach inside and with quite big holes too. If you just cut the bread in thin slices and you grill it a bit, it will be perfect for the tomatoes bruschetta or just the garlic and oil one! However i used in this case a Baguette or Baton ( the french bread is more welcome than the italian here in London), i cut some slice and i put it in the oven to grill them a bit, before to put the tomatoes mix: this is another important step to make a perfect bruschetta. Then to make it truly original you can even pass a piece of garlic on the bread still hot and add a bit of oil. At this point the bruschetta will be irresistible. For the crostini i instead placed a piece of Parma ham on the bread, some mozzarella and another piece of ham and i put them in the oven to melt and get a bit crunchy. 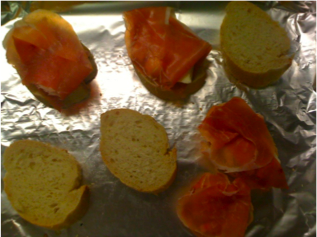 You can even put some mozzarella on the top or just some Parmesan thin slices before to serve them. PS. Mamy oggi ho ricominciato dalle basi e visto che ci stiamo avvicinando ad un clima un po’ piu’ mite, ho pensato di spiegare una volta per tutte come ottenere una bruschetta DOC. qualche settimana fa infatti ero andata in un ristorante italiano e non sai che roba ci hanno rifilato! Per bruschetta e crostini ho tolleranza zero! Sono troppo semplice da fare per poter sbagliare.